Janet Angell Schramm (1918-2015) was born in England to Clara Irene Blakeway and Arthur James Angell. Janet worked in the clothing design department in London’s Fortnum and Mason, and during World War II as a bomb fuse inspector. She survived the bombing of her apartment during the Blitz. She married David Chambliss, of Lookout Mountain, Tennessee, who died during the war. 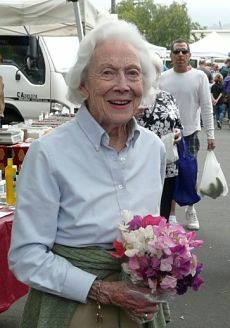 She later met and married Edward W. Schramm and in 1946 moved to Santa Barbara, where Ed resumed his legal practice with Schramm and Raddue. Jan and Ed were devoted to each other during their 37-year marriage; Ed died in 1982. Janet often said that she saw no point in complaining about the hardships of life, and she lived her life with strong intention, eternal optimism, and consistent generosity. Jan was elegant, and loved to sing and go out dancing. She elevated daily tasks into fine art, creating beauty all around her. While she travelled extensively, she appreciated life in Santa Barbara and often spoke of the sense of joy she felt during walks on Butterfly Beach and visits to the Botanic Garden. She lived in Santa Barbara for 69 years. She died on October 28th after a short illness. She is survived by her children, Peter, Gretchen, Judy and Jenifer, her grandson Shane Boland, her sister Mary Evans, and her nieces, Susan Feinthal and Rebecca King.